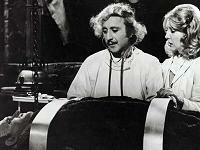 Primarily targeting cinematic adaptations of Mary Shelley’s popular nineteenth century novel, ‘Young Frankenstein’ tells the tale of anatomy professor Frederick Frankenstein (longtime Brooks’ fave Gene Wilder), grandson of the infamous Victor Frankenstein, whose dangerous experiments in re-animating the dead went horribly and publicly awry. After inheriting his family’s estate in Transylvania and discovering his grandfather’s secret laboratory, Frederick follows in Victor’s footsteps. With the help of his assistants and house servants -- Inga (Teri Garr), Frau (Cloris Leachman), and Igor (Marty Feldman) -- the newly-mad scientist creates a monster (Peter Boyle) after inadvertently using an abnormal brain to reanimate a reassembled corpse. When the creature inevitably escapes, Frederick has to contend with a German inspector (Kenneth Mars), calm a mounting mob, and find a way to make his monster more human. Shot in black and white with countless nods and jabs at any 1930s horror classic you can imagine (most of which have since become comedies themselves), ‘Young Frankenstein’ is unrelenting in its parody, exploiting every aspect of the early genre for as many gags as Brooks can muster. Relying on silence as much as dialogue, Wilder and crew weave effortless, exaggerated expressions into their performances and create characters whose thoughts you can almost hear. Better still, whether it be the relationship between man and monster, the mob mentality of the local townsfolk, the bumbling ironies of Frederick’s assistants, or the throwback musical score, the director and his cast hit every joke and blurb of dialogue as if it’s the last thing they have in their arsenal. In fact, the entire film exhibits a similarly fierce abandon, yet never feels unwieldy or unfocused. Interactions are witty and satirical, the monster sequences single-handedly craft the film into a dazzling farce, and there’s enough tongue-in-cheek humor to leave any comedy fan in stitches. The only thing left to endure is Brooks’ particular style. Needless to say, if you’ve never enjoyed his setups, punchlines, and mad-hatter physical comedy (you can practically hear a drumset beat out a bah-dump-tiss after most jokes), you’ll probably cringe at ‘Young Frankenstein’ since it’s a decidedly ham-laced comedy. However, if that’s a hurdle you frequently leap without any problem, ‘Young Frankenstein’ is arguably the best Brooks film you’ll ever see. Timeless laughs, acute intelligence, and sharp writing make this one a classic that will always have a special place in the comic catacombs of my brain. The Blu-ray edition of ’Young Frankenstein’ features an excellent 1080p/AVC-encoded transfer that thoroughly outclasses and outshines its standard DVD counterpart. The black and white source has undergone a thorough remastering, resulting in a clean image, inky blacks, and bright whites. Mid-range grays look fantastic as well, giving the picture convincing depth and dimensionality. Best of all, detail is sharp and textures have been rendered with the utmost care. A handful of shots are softer than the rest, but I never got the impression that it should be attributed to anything other than the original print. Likewise, grain fluctuates from shot to shot, but it’s obviously the result of the director’s intention rather than a nefarious issue with the transfer. If I have any technical complaint, it’s that contrast isn’t as consistent as I would have liked to see. Despite the quality of the transfer, fans should brace themselves for the increased scrutiny that a high-def presentation brings to the film -- weak make-up applications, obvious prosthetic seams, and costume mishaps may as well have giant PiP arrows pointing at them. Nitpicking aside, I was relieved to find that the image didn’t suffer from any substantial artifacting, noise, edge enhancement, or DNR. ‘Young Frankenstein’ doesn’t look better than the jaw-dropping remaster of ‘Casablanca,’ but it comes pretty close in several scenes. You won’t be disappointed. 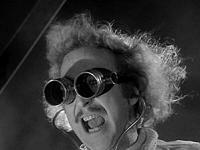 ’Young Frankenstein’ lumbers onto Blu-ray with options for progressive fans and purists alike: a newly remixed DTS HD Master Audio 5.1 surround track and a faithful remix of the film’s original mono. While each track is challenged by thirty-four years of age, each one manages to impress on its own terms. Both offer crisp and intelligible dialogue, reliable prioritization, and increased soundscape clarity. The lossless surround track takes things a step farther with some decent LFE support, precise (albeit sparse) detail in the rear speakers, and a balanced and multi-channel presentation of the film’s musical score. Even so, the DTS HD audio is quite front-heavy -- even for a remixed surround track -- and oftentimes sounds as if its designers wanted to be as true to the original mono as possible. While their design philosophy didn’t bother me in the slightest, I imagine there are audiophiles out there who will read “DTS HD Master Audio 5.1” and expect far more than this remix actually delivers. Regardless of which track you choose to listen to, the results speak for themselves. ‘Young Frankenstein’ will never turn heads or wake the kids, but Fox has paid respect to the original source and given us a pair of faithful tracks that focus on the film rather than your receiver’s various bells and whistles. 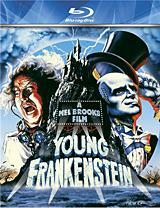 The Blu-ray edition of ‘Young Frankenstein’ includes all of the significant special features from the film’s previous SE DVD, and even offers fans a slew of BD exclusives for good measure (discussed at length in the next section). 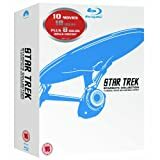 While the older content is presented in standard definition and the behind-the-scenes coverage tends to get a tad repetitive, the breadth of the package adds a lot of value to this release. Audio Commentary -- Legendary comedy writer/director Mel Brooks delivers a smooth, informative chat that covers scripting the film with Gene Wilder, casting, the production itself and, to an extent, the filmmaker’s career. The track is a bit dry from time to time, but Brooks does his best to keep things lively, alternating between amusing anecdotes and more deliberate details about the story, its classic gags, the black and white aesthetics of the film, and the shoot itself. All things considered, this is a top notch track that accomplishes everything a solid commentary should. Making Frankensense of Young Frankenstein (SD, 42 minutes) -- Using cast and crew interviews, behind-the-scenes footage, and several candid dissections of the classic film, this extensive documentary follows the production from beginning to end. It looks rough around the edges (especially when compared to the exclusive high-def features found elsewhere on the disc), but it’s a well-produced and welcome inclusion to the overall package. Deleted Scenes (SD, 16 minutes) -- The seven deletions in this collection can’t compete with everything else that made the final cut of the film, but they’re fun to watch all the same. Blooper Reel (SD, 5 minutes) -- This short series of mildly amusing outtakes grow tiresome before the reel is complete. Ah well. Bonus Interviews (SD, 7 minutes) -- A few brief interviews with Gene Wilder, Marty Feldman, and Cloris Leachman on a Spanish-language television show. Production Gallery (SD, 35 minutes) -- A seemingly-endless parade of production stills, behind-the-scenes photographs, and marketing campaigns. Marketing Materials (SD, minutes) -- Rounding out the package are five theatrical trailers and nine TV spots. 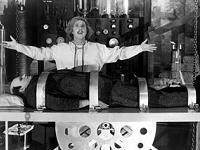 ’Young Frankenstein’ is, without a doubt, one of Brooks’ finest films and a true comedy classic. Thankfully, its Blu-ray debut is a godsend for fans that boasts an excellent video transfer, a pair of faithful audio tracks, and a generous supplemental package (not to mention a slew of exclusive, HD features). Needless to say, it’s an exciting release that will make a perfect holiday gift for that classic horror or comedy fan in your life.